Murray, P. L., Official Records of the Australian Military Contingents to the War in South Africa, p. 568. First Battalion Australian Horse Tasmanian Half Unit. Tasmania furnished one company (or more strictly one half-company) as her quota to the First Battalion, Australian Commonwealth Horse. For organization, equipment, pay, etc., vide that Battalion, New South Wales, page 166. Mere selected were required to be good shots and good horsemen; those of previous service in South Africa had preference if medically fit. Married men were not enlisted and unmarried officers had preference, other conditions being equal. Establishment :- 1 captain, 2 subalterns, 1 sergeant-major, 1 quartermaster sergeant, 2 sergeants, I farrier-sergeant, 2 abasing-smiths, 1 saddler, 1 bugler, 3 corporals, 47 privates, including 2 paid lance-corporals; total, 62. There were not any Tasmanians on Battalion staff. The condition of enrolment was 12 months or the duration of the war; and payment was by Imperial. Government Commonwealth Treasurer's authority, No. 7, 1901-2. Many of the N.C.O. 's and men had served in previous Contingents. The half-company left on the 16th February, 1902, comprising - 3 officers and 39 others, with 63 horses. Two died; 3 officers, 57 others returned. There were not any promotions of officers. For promotions of N.C.O. 's and men vide nominal roll. "E" Company, 1st Battalion, Australian Commonwealth Horse, embarked at Hobart on transport Manchester Merchant, 16th February, 1902, and arrived at Durban on 14th March. From 15th April to 28th June, served with the Australian Brigade, under the command, first of Colonel De Lisle, and latterly of Colonel Williams ; the Brigade forming during the same time part of Colonel Thorneycroft's Force. 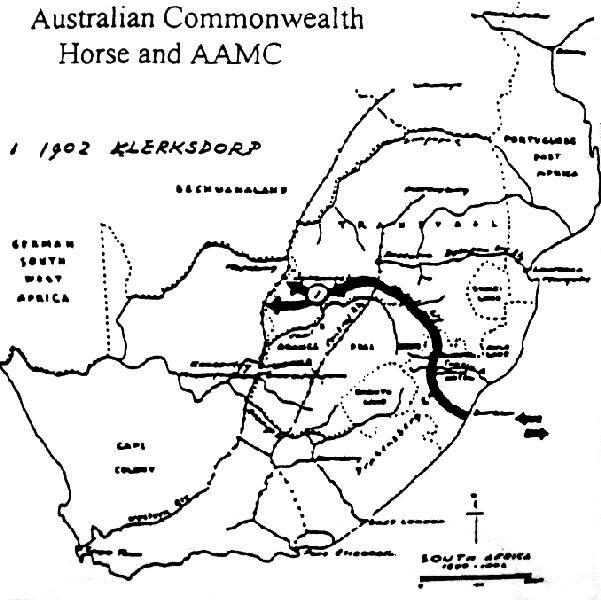 Participated in operations in the Transvaal, and the great final " drive," vide 1st Australian Commonwealth Horse, New South Wales. Embarked on transport Drayton Grange at Durban, 11th July, and arrived in Tasmania, 9th August, having visited en route, Albany and Melbourne. Disbanded, 19th August, 1902. One officer had passed through previous service in the First Tasmanian Imperial Bushmen, which see; the others were awarded Queen's Medal with clasp. Murray, P. L., Official Records of the Australian Military Contingents to the War in South Africa, p. 569. The Roll of Honour contains the names of all the men known to have served at one time with the 1st Battalion Australian Commonwealth Horse Tasmania and gave their lives in service of Australia, whether as part of the 1st Battalion Australian Commonwealth Horse Tasmania or another unit during the Boer War.